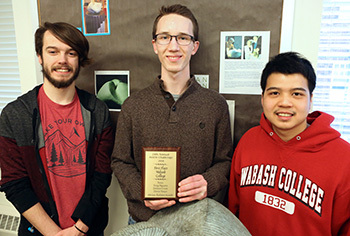 The Wabash College Math Department has announced that a of three students, Delmas Crum ’22, Tung Nguyen ’21, and Devin Vanyo ’22, are the winners of a nationwide math competition. The Alma MATH Challenge was held in November and consisted of taking a three-hour exam with 10 problems from concepts found in undergraduate mathematics curriculum. Students took the exam on their home campuses under the supervision of a faculty advisor. Two teams of three Wabash students participated, and the other team of students, Joseph Bertaux ’19, Alexandru Rotaru ’22, and Wayne Nguyen ’19, came in 15th place out a total of 64 teams. "This year's exam was very challenging, and the department is proud of the persistence and problem-solving skills of both teams," said BKT Assistant Professor of Mathematics Kathleen Ansaldi. The winning team was presented with their first place plaque on Thursday, Jan. 31.